From the Carradice Originals range the Camper Longflap saddlebag is made from 100% waterproof 18oz Cotton Duck & is available in two colours. The Camper Longflap can be attached to saddlebag loops, a saddlebag quick release or clamp via leather straps & buckles. The buckles & fastenings are all metal whilst the straps are made from chromed leather, which means they keep their strength & looks no matter what weather & conditions they face. All Carradice Originals bags come with a lifetime guarantee against defective materials & workmanship. ConsToo small front to back by 7cm or 2.75in. ProsTop grade materials and fine craftsmanship. The Camper Longflap is beautifully made with high quality materials and good craftsmanship. However, it is 7mm too short front to back (depth), making it useless to my needs even though I checked first. I'd like to return it, as it is short by 5.88l in volume, space I need for food and other necessities. The dimension that we give on our website for this bag are correct. I understand where you have gotten confused with the volume though as the dimensions are only for the main compartment where as the total volume includes the two side pockets which account for the additional 5.88 litres that you think are missing from the bag. I did some reviews before I bought this but it's better than I excpected. Great quality and loads of room for all my kit. End to End in September and with this it should keep my kit nice and dry even in Scotland. I've just fitted the SQR system and it works like a dream. Beautifully made, classic design and heaps of room. Got it recently to turn my road bike into a tourer and it worked really well with the SQR Bagman. Took a while to get used to all the extra weight sitting quite high behind you, and there definitely is still a bit of movement when on rough roads. Sometimes the SQR part can be a bit fiddly, particularly if the bag is already full when you put it on. Bag itself looks great, is very sturdy and I look forward to using for many years. The quality is excellent and the attention to detail is superb I am very pleased with this product and it is British made by Sue . Well done . A superb looking, confidence inspiring high quality bag that I am sure will hold by gubbins for years to come. I bought this to give me another option to my courier bag, which I have used for commuting for a couple of years. It takes the weight off your back and puts it on the bike, as one might expect. With the SQR system, this gives a weird "tailwagging" sense to the bike, which is a relatively lightweight Specialized Langster. At first this was really offputting, but I am used to it now and the improvement in body ventilation has worked wonders in terms of comfort. Its carrying capacity is immense, and really couldn't be much bigger. Fully loaded, the "wagging" sensation is accentuated, but once you're used to it it is manageable. It can comfortably fit a ton of stuff. For example, four loaves of bread would fit easily, without using the longflap. Seems expensive until you get it in your hands, the quality is stratospheric, can't think of a way to better this bag, The label inside says it was handcrafted in Nelson by Sue, who has signed it. Any loss of faith in British manufacturing I had has evaporated. It's got huge carrying capacity and looks great, don't leave this bag on your bike it will go, especially in these days of 'retro cool.' Get the SQR system which works great. I know this will last at least 20 years, unbelievable! They really do still make them like this. 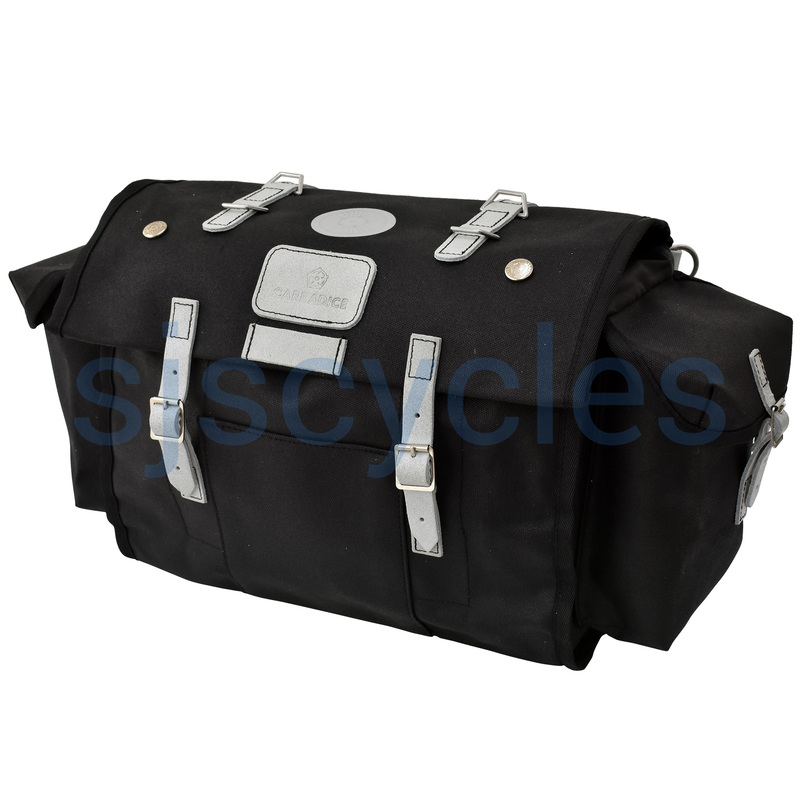 I'd like to purchase one of these bags along with the bagman expedition support but read somewhere that the bagman support wont readily fit to the rails on a brooks B17 saddle. The rack will fit nicely on to the narrower part of the rails on the saddle, However this will restrict backwards movement from the saddle on the seatpost. Recent talk on several forums indicates some Camper Longflaps vary in their dimensions by time of manufacture. Please, can you verify the actual dimensions of the interior compartment are as stated, H 24cm x W 35cm x D 23cm. May thanks, as this will help me decide which model to buy. The bags we have match the dimensions shown on our website. For a shipping quote just add all of the items you are looking at into your basket. The website should automatically provide you with a shipping quote. If it doesn't you may need to sign in and provide a delivery address.